One of the things that I try to acheive in my photographs is a full-on in your face image. I try and put the viewer closer to the subject than you would normally be able to get. Today I had three opportunities to get that close, all without any distress to the subject of course. The Cattle Egret (above) was part of a small group of five that I photographed from the car window. I draped a piece of cam net over the door to conceal myself and then waited for the Egrets to come very close, they continued to feed right next to me. I was hoping to get some shots with prey but it just didn't happen unfortunately, but the head shot portraits are really special and will make a great addition to my galeries. They were feeding on large spiders oddly enough. As I photographed the Cattle Egrets, a White Ibis came along by the edge of the road feeding in a totally different way, probing in to the earth with it's long pointed beak. Like the egrets, it was oblivious to my presence and it was mostly too close to get it entirely in the frame of the camera. The photographers, not cropped at all, get right in there to the centre of the feeding action. These photos were taken at Brian Picollo Park, we had gone there to have a look for Burrowing Owls, this is a well known nesting area for them. We are a bit early in the year for breeding though, and there was no sign of them today. In the late afternoon we returned to the beach and East. It was a lovely surprise when on the beach I was confronted with some waders! To be specific some tiny Sanderling and more interestingly, a small flock of Grey Plover, known in the US as Black-bellied Plover. With the sun now very low in the sky, the light was just perfection! Every week the Birdguides Website, the most visited birding website in the world with with an average of 49,000 views a day, (what an amazing statistic), runs a competition for their photograph of the week. It is a massive accolade to win this weekly competition and lots of bird photographers post their pictures regularly, all photographs uploaded, are then "entered" in to the competition. To date there are 203,450 pictures representing 3934 species. As well as the prestigious Photo of the Week, the runners-up, are recorded as "Notable" . To have a picture mentioned as "Notable" is a great achievement. 17 of my pictures have been recognised as "Noteable" and as well as this I am a twice winner of the "Photo of the Week". My Cuckoo photo taken in June was my second "Photo of the Week" and out of the 203,450 pictures on the sight, is the 10th most popular picture! My Kingfishers fighting "Photo of The Week". My Cuckoo "Photo of The Week"
This week my Goosander photograph taken at Venford Reservoir was a nominated as a Birdguides Notable Photograph and here it is. 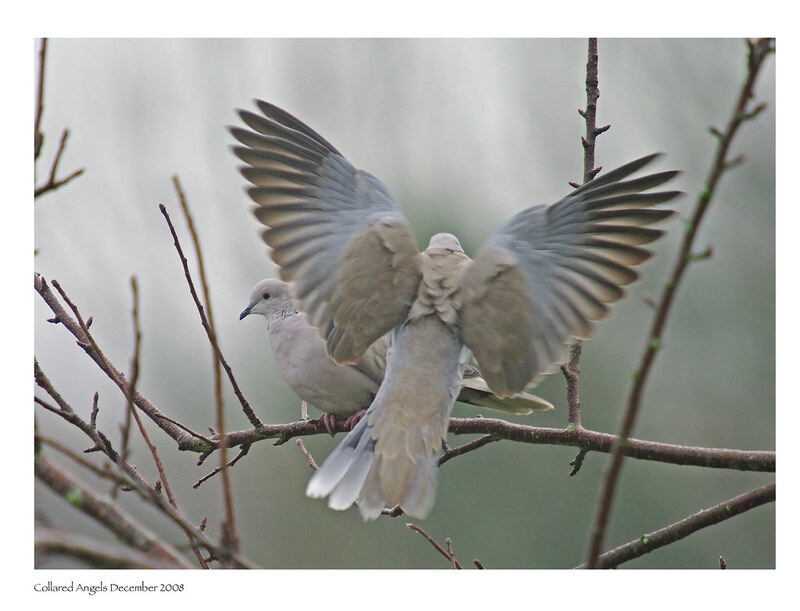 Not a lot can be said about our Collared Doves that hasn't been said before. 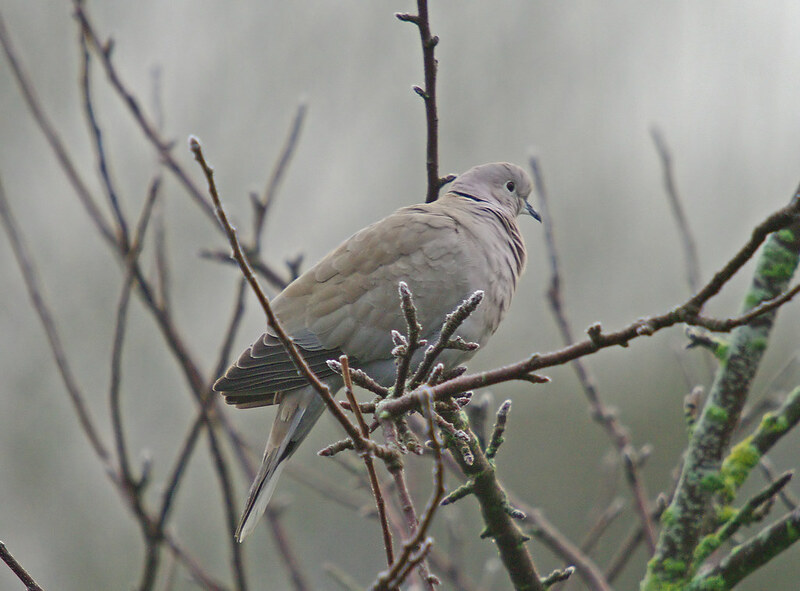 They come and go and can be seen most mornings at Dawn in the Apple tree at the bottom of the garden.They rarely settle in the garden, never visit the bird feeders or bird table and fly off as soon as the door is opened, however it is always lovely to see them. I know that in the summer they bred in this tiny little patch of mine. Today it was an almost complete "white out" with fog which hadn't cleared when this photo was taken at around 9.15 As a species they have colonised the UK over the last 40 years to become one of our most familiar birds but the first breeding in the UK was as recent as 1956. As far as I know they can't be sexed visible but when two are together there will be subtle differences in head shape, size and colour etc. Today is the 1st anniversary of my fathers death, he was a bird lover and inspired me to enjoy the birds and wildlife around me. 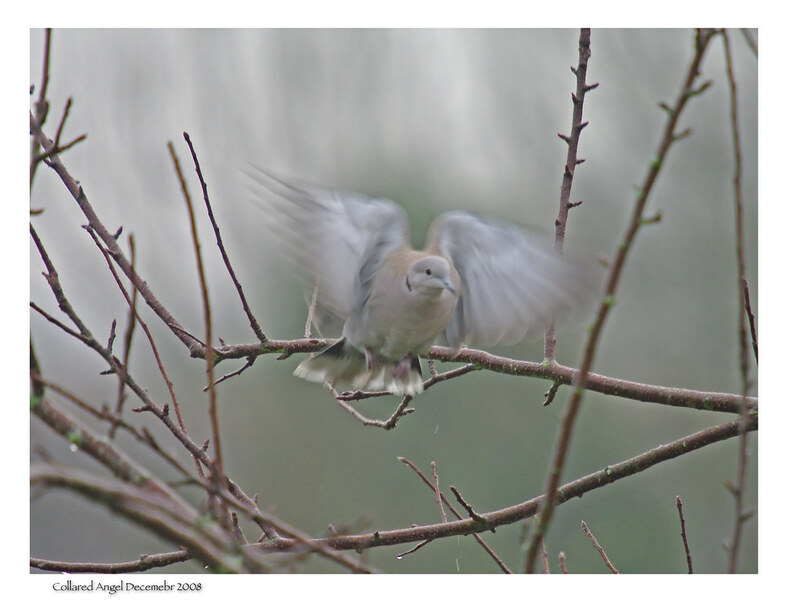 Thought these Doves looked like angels in my garden, stupid I know but look at the similarity!